A small town murder. A second chance at love. Somebody killed Joey Gaccione’s brother. After a ten-year absence, the big city detective returns home to Colorado for the funeral knowing he will be pressured to find Sheriff Sam’s killer. Joey’s instincts say whoever murdered his brother is part of something more sinister than the Elkridge deputies can handle. Mara Dijocomo’s dreams died the night a drunk driver killed her parents and sister, and left her permanently wounded. After months of therapy, she’s finally adjusting to her new reality while working to save her mother’s floral business. When the first boy she ever loved walks back into her life, she wonders if she and Joey are getting a second chance to find love. 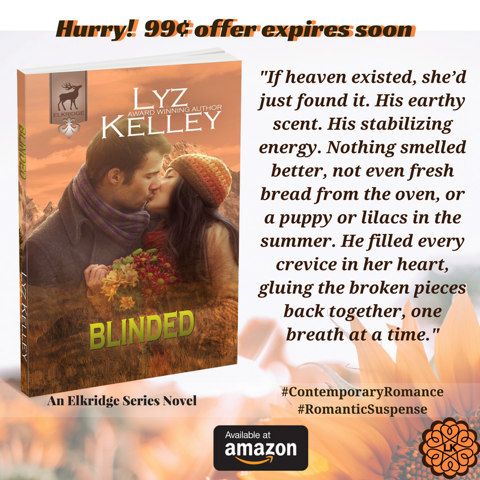 As Joey and Mara’s love blooms, the evidence becomes clear the local deputies are either ill-equipped to comprehend what’s happening, or someone’s covering up a crime. Joey and Mara fight to balance between their careers, family, and their renewed love until the FBI contacts Joey ultimately tipping the scales. 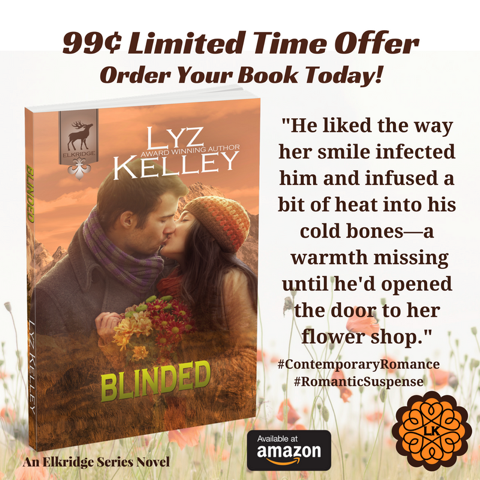 If you like a steamy romance, deep emotional topics, a thread of mystery, and a cozy happy ending then BLINDED is for you. The first book in the ELKRIDGE SERIES debuts a quirky cast of characters and begins introducing evidence to solve Sheriff Sam murder. 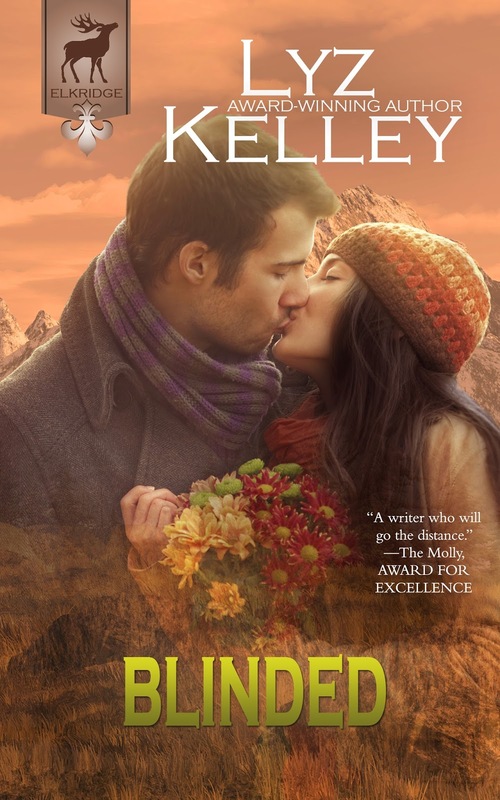 To keep tabs on her award-winning novels, connect with Lyz by signing up for her newsletter at LyzKelley.com. Also visit LyzKelleysHeroes.com to join Kelley’s Heroes, Lyz’s VIP club. Members receive an exclusive copy of A Soldier’s Wife, learn about thoughtful giveaways, and get a sneak peek at upcoming releases. Members may even get the opportunity to receive advanced reader copies. Check out LyzKelley.com for more information. Why would readers enjoy this book? Why did you develop Elkridge, your small-town series? Both my mom and dad grew up in small towns and I loved the idea of a microenvironment for the setting of my series. Since childhood, I heard many fun stories about small-town life. 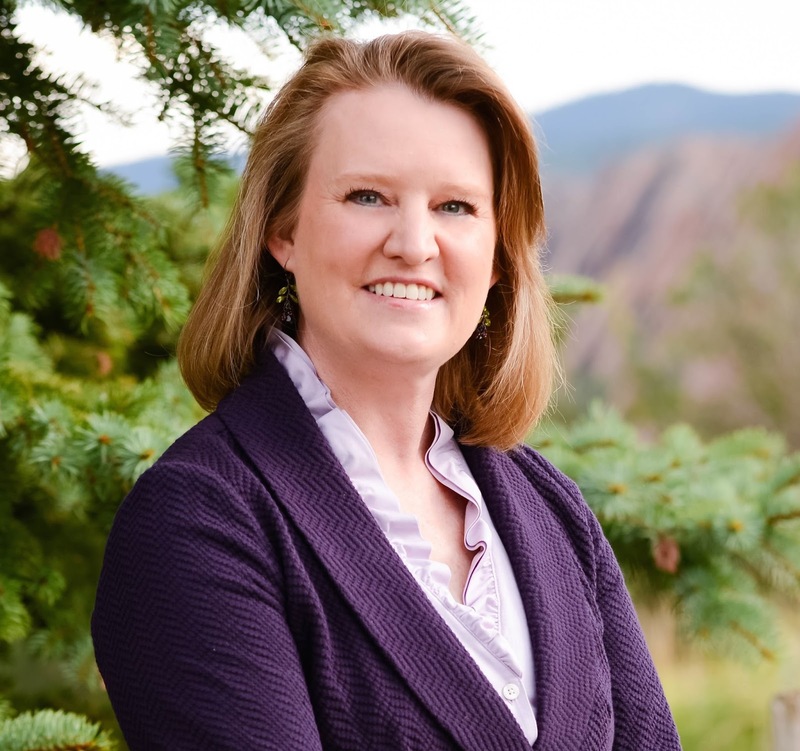 I lived in a fairly small town growing up, so I figured why not create a town in Colorado? Elkridge was pulled from many different elements of nearby mountain towns to create a unique place. Don’t go looking for Elkridge, it doesn’t exist, but have fun visiting through my new series. You mention in your author notes working with an FBI Special Agent. Yes, Special Agent Michael Bantner came to speak to our writing group when I lived in Philadelphia. Years later, when I started plotting the Elkridge series, he helped with the technical aspects of the plot. He loved my story idea, and said it was one of the most realistic plots he’d heard. I was very excited. To get some of the local details correct, I also interviewed one of my high school friends, who worked in the local sheriff’s department. I love research, so it was a lot of fun. Are any characters in BLINDED based on real people in your life? The character that is most real to me is Sam. My brother, Sam, was always going head first into life. Always wanting to be the hero, he often didn’t listen to other people’s advice. Don’t get me wrong—we were best friends, and I loved him dearly. When he died just before I graduated high school, I was devastated. I can relate to how both Mara and Joey feel about people they love being snatched from their lives. Those feelings are real, and even after all this time, I still can feel the chasm my brother’s absence has left on my heart. When Joey first shows up in Elkridge, he has no intention of searching for his brother’s killer. Why? My technical experts suggested a brother wanting to investigate his brother’s murder, in another jurisdiction, would not be feasible. Sure, romance books are based on fantasy, and there is nothing better than an alpha male charging in to save the day. However, I wanted to write a more emotional book. When my brother died, we were very close. While writing the book, I started asking myself , what if Joey wasn’t close with his brother? What if he had regrets? What if he could investigate the most horrific crimes, but couldn’t stomach investigating his brother’s homicide? Mara is such an unusual heroine. How did you develop her character? Mara was developed out of an exercise at a writing retreat. C.J. Lyons, a New York Times best-selling author, was giving a lecture on the use of senses in writing. Most authors use sight as the primary go-to sense, and we were exploring the use of other senses to add flavor to our writing. I really struggled with the exercise. Like anything, I knew that conquering a problem takes practice. So, I wrote a novella. Then a friend talked me into writing a full-length book—thus BLINDED was created. Where did you get the idea for Kym’s quirky character? Kym, Mara’s best friend, was a lot of fun to write. Mara, the heroine, is so serious and a bit like me that I thought she needed someone who tilted her world a bit. There were times when writing Kym, I had to laugh. The humorous funeral scene actually happened to a friend of mine. She and her family were at a funeral and her uncle started cracking jokes to lighten the heaviness of the situation. Since I couldn’t find any way around excluding a funeral scene from the book, I decided to adopt the idea to make the scene a bit lighter. There are so many fun characters in Elkridge. Are you planning to write more books? Yes, book two is Kym’s book. It’s a 85-page novella. If you want a quick weekend or airplane read, SPURNED is a good book to pick up. The eBook will be available in March. 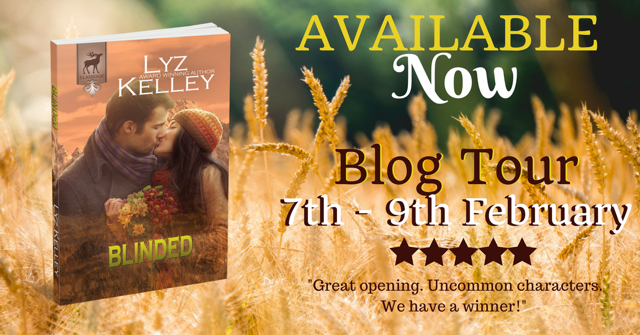 ABANDONED is a full-length book that introduces new characters and includes characters you met in BLINDED, will be available in April. All books in the 6-book series should be out in 2017.